Spotted by SOHO, 070925_P/2007 R5 (SOHO) is a periodic comet like Halley's comet that makes one orbit around the sun every four years. 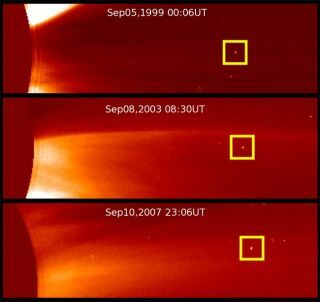 The Solar and Heliospheric Observatory (SOHO) has spotted an unusual comet that flies around the sun at regular intervals. Dubbed P/2007 R5 (SOHO), the object belongs to a rare class of comets called periodic comets. Only 190 of the thousands of known comets are periodic. The most famous periodic comet is Halley's Comet, which can be seen from Earth every 76 years and last passed close to the sun in 1986. While many of SOHO's 1,350 detected comets are suspected of being periodic, this is the first one conclusively proven and declared as such. The new comet has a much smaller orbit than Halley, taking only about four years to travel once around the sun. It was first seen in September 1999, and then again in September 2003. In 2005, Ph.D. student Sebastian Hoenig at the Max-Planck-Institute for Radioastronomy in Bonn, Germany, speculated the two comets were actually the same object. Hoenig's realization is similar to the one made by English astronomer Edmond Halley, who in 1682 connected a comet he saw to two previous comets observed in 1531 and 1607. To test his idea, Hoenig calculated a combined orbit for the comet and predicted it would return on Sept. 11, 2007. The comet appeared right on schedule. P/2007 R5 (SOHO) is estimated to be about 330 to 650 feet (100 to 200 meters) in diameter. Unlike most comets, it does not have a tail or a glowing halo, called a coma, of dust and gas around its head. But as it passed within about 5 billion miles (7.9 million kilometers) of the sun, the comet brightened by a factor of a million—a common behavior for a comet. "It is quite possibly an extinct comet nucleus of some kind," said Karl Battams, who runs SOHO's comet discovery program. Extinct comets are those that have expelled most of their volatile ice, leaving little material to form a tail or coma. P/2007 R5 (SOHO) is expected to return in September 2011. SOHO is a joint mission run by NASA and the European Space Agency (ESA). Video: Killer Comets and Ominous Asteroids!